This past Tuesday was a special night at the Durham Performing Arts Center (DPAC). 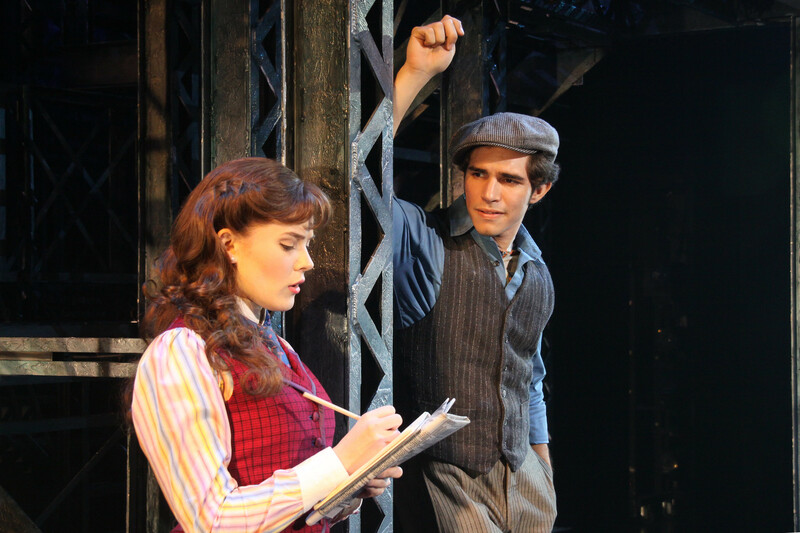 Not only was it opening night for Newsies, but DPAC also welcomed its 3 millionth guest! I’ll share more about the lucky guest in a minute, first lets get to my review of the show. 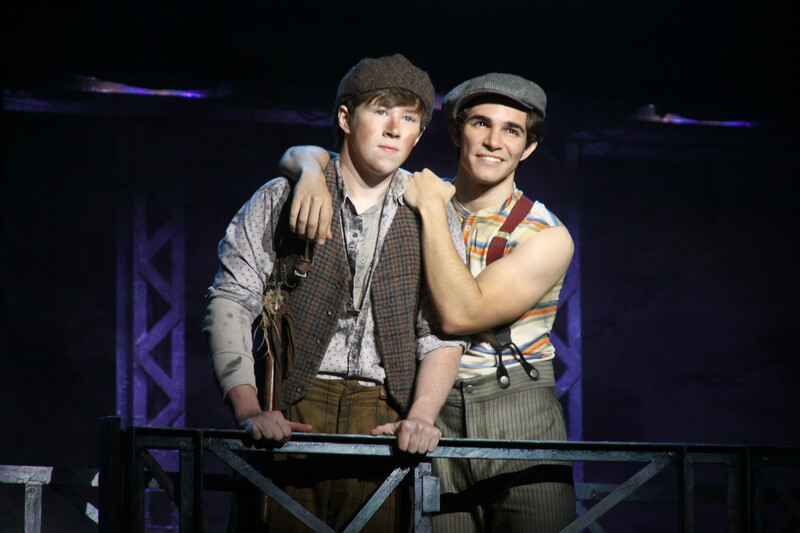 The current production of Newsies is an updated version of the 1992 Disney movie musical that tells the story of the 1899 newsboy strike in New York City. Joey Barreiro plays Jack Kelly, head newsboy and leader of a ragtag group of boys (newsies) who sell newspapers on the city streets. 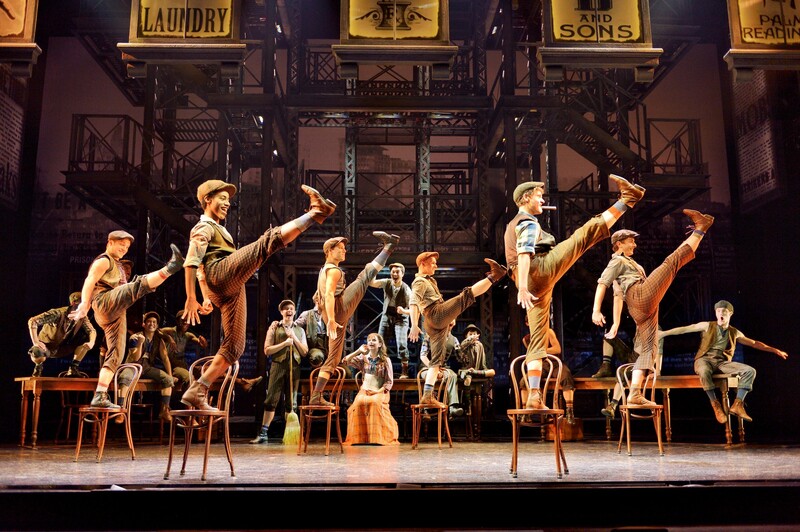 Jack and the newsies, already struggling on the fringes of society with the daily toil of trying to earn enough to survive, rebel and form a union in response to the powerful owner of the paper after he raises the price the boys pay for the papers to pad his bottom line. An added character and love interest not part of the original movie, Morgan Keene plays Katherine, an aspiring newspaper reporter looking to cover the strike to show she can cover real news for the paper and breakout from puff pieces she is assigned to for the paper’s society page. Barreiro and Keene have a great chemistry on the stage and both put on strong performances in these central roles. But Newsies is a little different from some of the other shows I’ve seen recently. The star of the show is the ensemble cast and their jaw-dropping and dance moves. The show is at its very best when the stage is filled with two dozen young men tapping, jumping, and doing back flips to the wonderful choreography of Christopher Gattelli. Honestly watching their amazing acrobatics reminded me of and Olympic gymnast’s floor routine. It really was that amazing and physically challenging! Speaking of physically challenging, one other aspect of the show that is sure to jump out is the innovative set by Tobin Ost. A central part of the set is an imposing three level group of three automated steel towers rising 24 feet above the stage. The design is a creative way to capture tenement scene of the city during the time period. It is also a clever to keep the action flowing as the cast climbs 75 steps to reach nine different distinctive areas across the towers. It is one of the more impressive set designs I have ever seen. This production of Newsies is a great show to see with the whole family that delivers a fun night of music, dance and comic relief along served with the valuable message of standing together to fight for what’s fair. It is a true underdog story that will leave you feeling inspired as Jack finds a cause to fight for and in the process rallies newsies and child labor from across the city to challenge to system for what’s right. 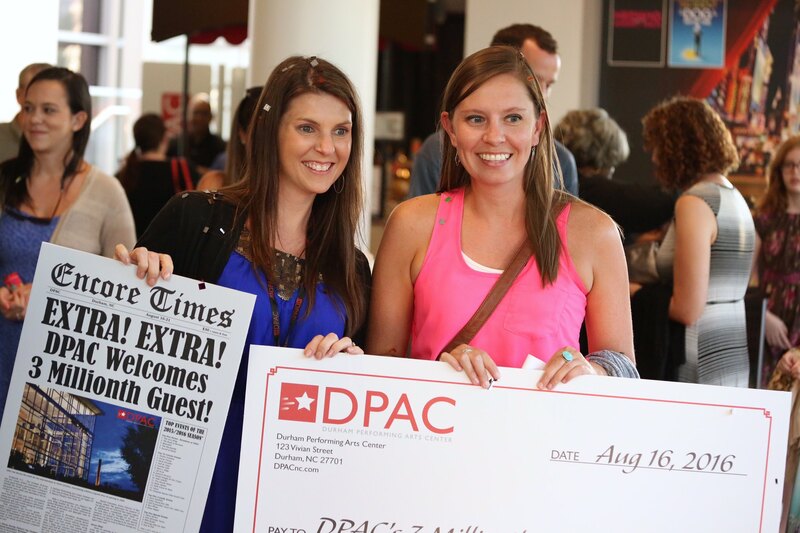 DPAC WELCOMES ITS 3 MILLIONTH GUEST! DPAC Welcomes their 3 Millionth Guest! As I mentioned above, on Tuesday night DPAC also celebrated an exciting milestone. Opening night of Newsies saw the arrival of the 3 millionth guest at DPAC and to celebrate they won some fun prizes to mark the occasion. The lucky guest was Erin Andrews, a Durham native who now lives in Burlington. Erin received a $1,000 gift certificate to DPAC and also got to meet the Newsies Cast back stage for a photo. It was a lot of fun being there with other media to capture the celebration when she walked through the door. Always fun surpsing people with good news. I captured the fun moment in a short video that you can view here.